Mirae Asset has come out with a New Fund Offer named Mirae Asset Prudence Fund. The Fund will be investing anywhere between 65% to 80% in Large Cap Equities and the balance of 20% to 35% in Debt and Money Market. 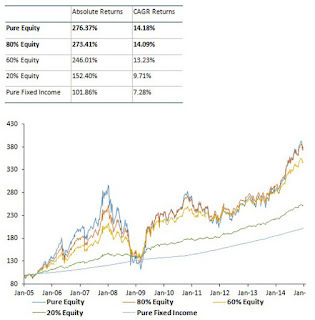 The Fund is focussed on Large Cap unlike other Balanced funds which also take exposure to midcap and even small caps. 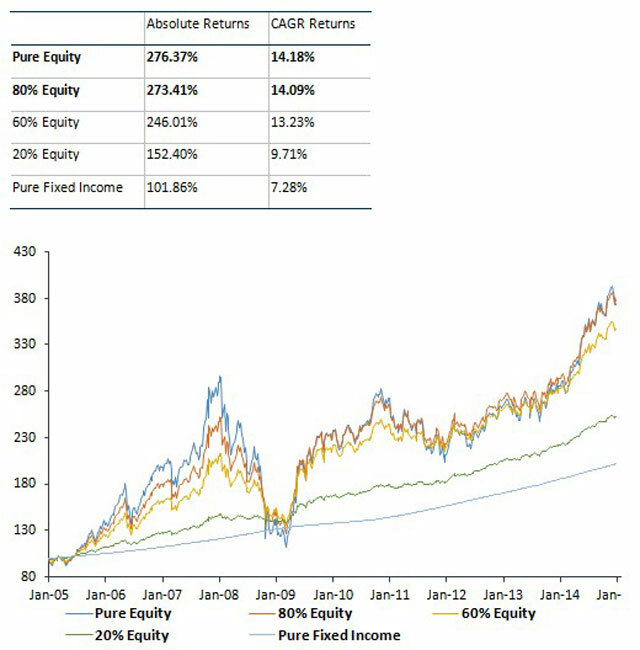 This large cap bias will ensure that the fund will face lower volatility and is well suited to Investors whose risk profile is Moderate. The fund has opened for subscription on July 8th and will close on 22nd July. The Fund will managed by Neelesh Surana and Yadnesh Chavan. Mirae has got its timing right in terms of lauching. The Markets are down by nearly 10% from the Peak and consolidation is happening. With Greece and China disaster hitting the FIIs, they will be forced to look "more" favourably towards India. Moreover, the EPFO money coming, the Stock Markets will get a BIG BIG boost which Mirae Prudence Fund will be well placed to capture. Having said that, the existing funds in the Market too will be in a similar position to capture the same growth and give returns. Hence, you may well continue to stay invested in your exisitng Balanced Fund and look at Mirae Asset Prudence Fund at a later date when it is able to show its consistency. Mirae has done exceedingly well with its existing funds and there is no reason why it will not be able to replicate the same with the Prudence Fund. I always ensure that all my clients have at least ONE Balance Fund in their Portfolio. Equity to maintain the Balance. Likewise, when Equity markets tank, the equity ratio declines and Debt raises, and thus the Fund Manager has to sell Debt and more Equity to maintain the Balance. This automatically ensures that the Fund Manager, invariably, is selling at higher rates and buying at lower rates. This Asset Allocation automatically ensures superior returns over Long Term (sometimes over even Pure Equity Funds). Balanced Funds are great for investors who are getting the first taste of Mutual Funds. So, if you are a Mirae Fan, go ahead. Others, (including Novice investors), do wait. I will update you surely in the coming months. Just a few names, but this should be sufficient.